1) I am not a Duchess. 2) I don’t only eat cake and feed my kids only sweets. 3) I am not on Nutella’s payroll. Now that we got those issues out of the way, I feel like you can get to know the real me. I am married to an Executive Chef. Some of you are really into my blog and read my tiny profile area and already know this. I know y’all are thinking: “She gets the best food!” and “He must cook every night.” He is home a handful of days every month, and on about 1 of those days, he cooks. That leaves me cooking the other 29 days every month. Of every year. I cook mostly Italian food. Sometimes you will see some Latino flavor in my recipe repertoire. I live practically in Cuba, and am not complaining. I get the best café con leche around the corner. That’s when my Español comes in handy. And sometimes I will just invent something like this dish. It is sort of Italasiantino (Italian, Asian, Latino). The savory shrimp are perfectly matched with the sweet and spicy salsa. The jasmine rice is fluffy perfection. I could eat this for breakfast. For the rice: bring 3 cups of water to a boil. When water is boiling, add the rice. Let come to another boil, and then lower the heat and simmer for 20 minutes. When your timer goes off, voila’, open lid to super fluffy rice. If you used frozen shrimp like I did, let it defrost in bowl of water while you are prepping the salsa. Salsa: Chop all of the salsa ingredients and then mix them in a large bowl. Add more lime juice if needed and a tablespoon or two of olive oil. The olive oil make it just a little better. Shrimp: Your shrimp are defrosted or you are using fresh shrimp, now is their time to shine! Heat up the butter in a medium sized skillet on medium-high heat. Sautee’ the garlic in the butter and olive oil. Add the white wine. Let it start to reduce, then add the shrimp. Sautee’ the shrimp. When they turn pink, they are done. It will only take a few minutes. Take the shrimp out of pan with a slotted spoon and place them in bowl. Turn the heat on high and let the white wine reduce more with the butter. It should only take a few minutes. Then spoon the sauce onto the shrimp. Plate up the shrimp on top of the papaya salsa like I did. It looks so fancy! Serve with the rice on the side. Sprinkle a little more chopped cilantro on the rice. You are in business! This is the most photogenic papaya I’ve ever seen. I still think you're on Nutella's payroll, but as long as you write delicious stuff like this again, i'll let it slide! P.S. I would eat this for breakfast! Italasiantino sounds like an awesome style of food! And that papaya salsa looks delish! I am so happy that I stumbled on your blog tonight. Not only are your recipes tempting and delectable, but you are hilarious! Thanks for sharing this…and I must say that your papaya is gorgeous! Me ha gustado mucho tu post, no se mucho inglés pero lo práctico con tu blog, la receta deliciosa. Thank you Chuck:)Happy you found my blog! Hola Ana! Muchisimas gracias! Your English is fantastico! :)besos para ti tambien! I bet you would get a lot of comments that you eat the best food every from the hubby haha. My first at your blog and this post helps me get to know you. Papaya salsa sounds very intriguing and I couldn't agree with you more that those papaya are photogenic! You may not be on Nutella's payroll but because of you I bought my first jar of it….ever. I'm hooked. Doggonit. This shrimp dish looks wonderful too. 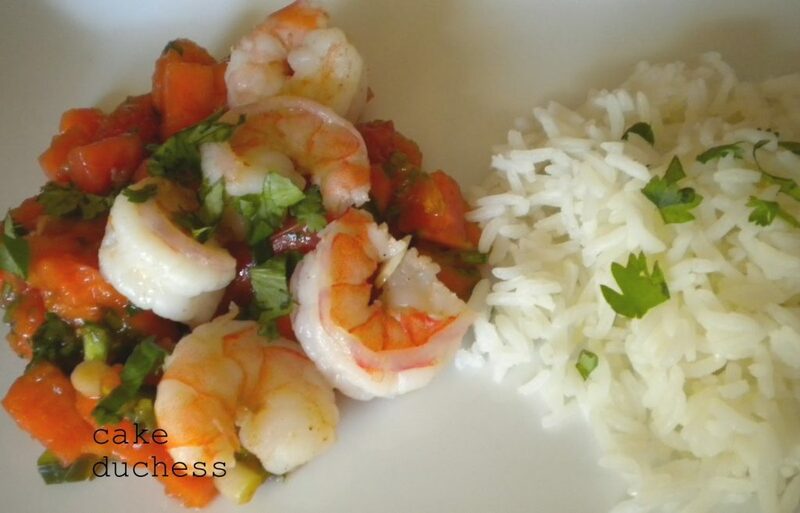 I love shrimp and jasmine rice and think they'd be a fantastic combination. I love the flavors in the papaya salsa. 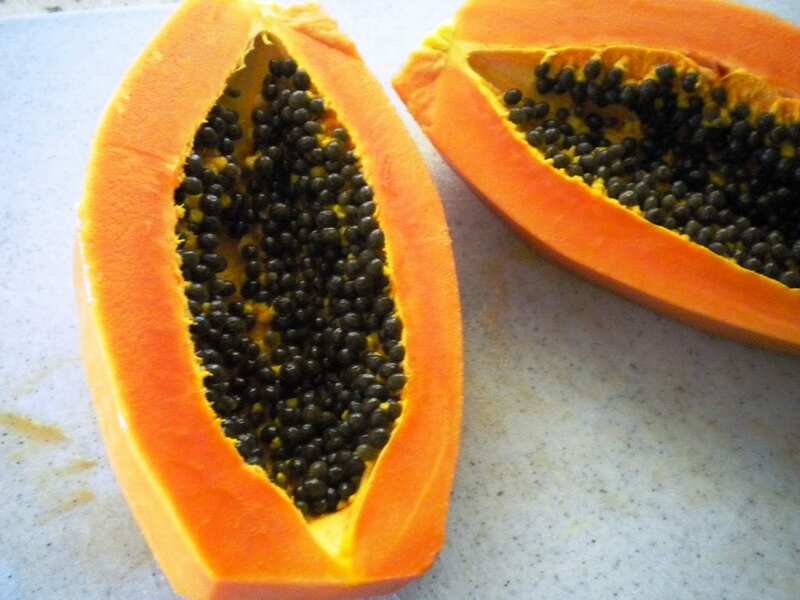 I only recently ate my first papaya (crazy, I know!) and love them!